I'm sure you've heard of pumpkin bread, but butternut squash bread? That was a new one for me. After making a loaf, it's a shame we've been strangers until now. The spark for this dish was lit during a recent Washington Post Food section chat, where I asked if there were any particular trends among this year's Thanksgiving recipes. Another chatter piped up that the big trend in recipes this year was butternut squash. I surveyed the dishes I had planned for the month thus far and...there wasn't a butternut in sight! So I wanted to add something, but I wanted it to be different. I've roasted butternut squash and tossed it with grains. I've pureed it into an appetizer crostini topping. I've even turned it into a cocktail (for more ideas, check out this recent 8-2-Eat on butternut squash recipes). I didn't want to repeat any of those things. Instead, at that Washington Post chatter's suggestion, I made bread. A search online uncovered an AllRecipes.com recipe that was exactly what I was looking for. 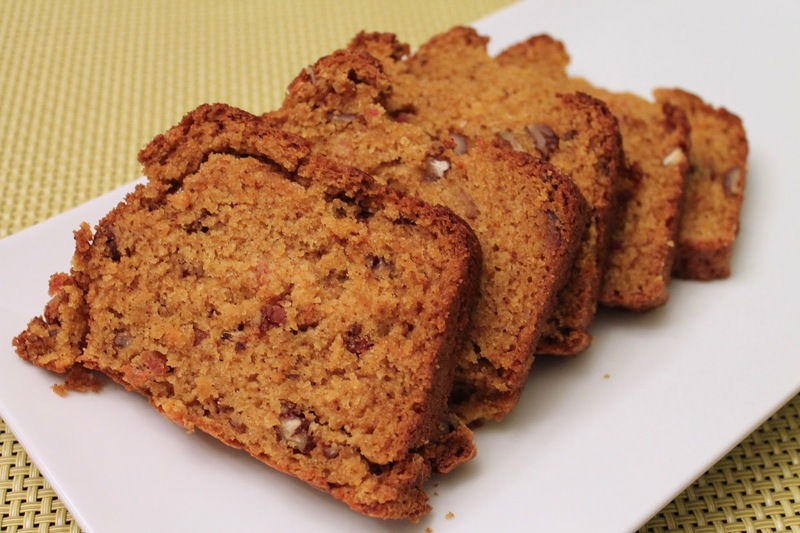 This recipe enhances the bread with walnuts and raisins. I went a different route: pecans and...bacon. Yes, bacon in bread! Why not? It's in everything else these days. I also cut the recipe in half to have just one loaf; you could certainly double it back if you want to make two. You'll just need two loaf pans. A word on prepping butternut squash. You can buy butternut squash already peeled, seeded and cut into large chunks at the grocery store. This makes turning it into smaller cubes for roasting quite simple. However, you can also start with a whole squash, which isn't as hard to deal with as you might think if you follow these directions that explain the steps in the picture above. Either way, the end result should be cubes about 1/2 to 3/4 inch wide (the smaller the size, the quicker it will roast). 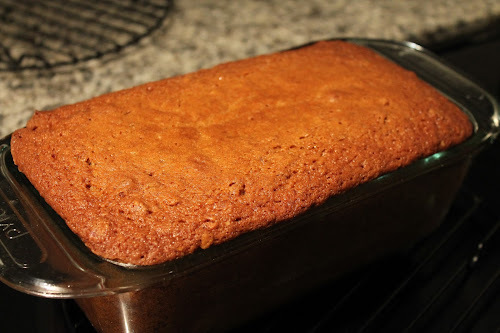 Since this is a "quick" bread--i.e. one that is leavened with baking powder and baking soda and thus rises while it cooks rather than the longer process of a yeast bread that requires kneading and rising time--it doesn't take very long to make, especially if you've roasted and pureed the butternut squash in advance. If you roast cubes from a whole squash, you'll have plenty leftover that you could freeze and later use for any of the roasted squash recipes I've mentioned here (see related links below too). Note: This recipe makes leftover roasted butternut squash, as it seems a waste to roast only enough needed for this recipe. I froze the leftover roasted squash to save for another purpose, like tossing into a grain bowl. 2. Add butternut squash cubes to a large bowl. Drizzle with vegetable oil and toss to coat the squash evenly with oil. Spread squash in an even layer on a baking sheet. Roast for 20-25 until tender. Set aside to cool. Add a heaping cup of the roasted cubes to a food processor and turn it on. Add a little water (start with a tablespoon; you can add a little more if necessary) if the squash is too thick to puree smoothly. The end result should be 1 cup of pureed squash. 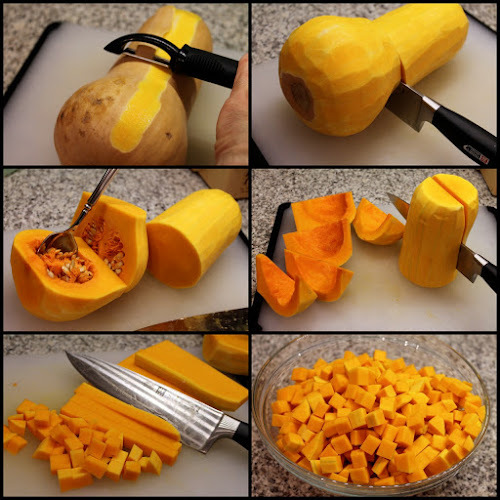 Add a few more cubes of squash and puree again if you fall a little short of 1 cup. 3. Adjust oven temperature to 350 F.
4. Cook the bacon in a frying pan over medium heat until browned and crisp. Transfer to a paper-towel-lined plate to cool, then transfer to a cutting board and chop into bits. 5. Combine sugar and butter in the bowl of a stand mixer (or a large mixing bowl if using a hand mixer) and blend on high speed until light and fluffy, about 5 minutes. Add the butternut squash puree, eggs and water and blend into the mixture on low speed. 6. In a separate bowl, whisk together the flour, baking soda, baking powder, salt, cinnamon and cloves. Add to the butter-sugar-squash mixture and blend on low speed until just combined. Stir in the chopped pecans and bacon bits. 7. Grease a 9 X 5 inch loaf pan with butter. Pour the batter into the pan so that it is even distributed in the pan. Bake until a toothpick inserted in the middle of the loaf comes out clean, about 1 hour. Set pan on a rack to cool for 15 minutes, then carefully remove the loaf from the pan and set the loaf on the rack to cool completely. Slice in 1/2-inch slices to serve.